National Renewable Energy Laboratory (NREL) scientists have developed a proof-of-principle photoelectrochemical cell capable of capturing excess photon energy normally lost to generating heat. 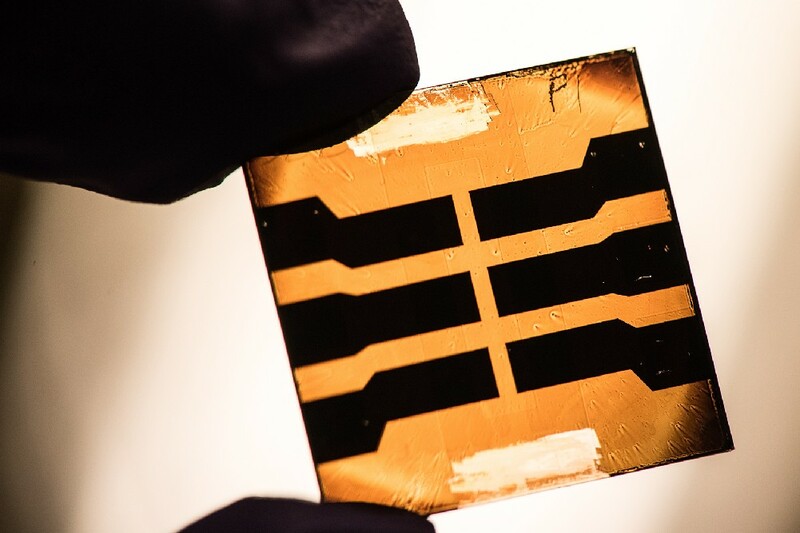 A lead sulfide quantum dot solar cell developed by researchers at NREL. Image Credit: Photo by Dennis Schroeder. Click image for the largest view. Details of the research are outlined in the team’s Nature Energy paper titled “Multiple Exciton Generation for Photoelectrochemical Hydrogen Evolution Reactions With Quantum Yields Exceeding 100%”, co-authored by Matthew Beard, Yong Yan, Ryan Crisp, Jing Gu, Boris Chernomordik, Gregory Pach, Ashley Marshall, and John Turner. All are from NREL; Crisp also is affiliated with the Colorado School of Mines, and Pach and Marshall are affiliated with the University of Colorado, Boulder. In 2011 Beard and other NREL scientists published a paper in Science that showed for the first time how MEG allowed a solar cell to exceed 100 percent quantum efficiency by producing more electrons in the electrical current than the amount of photons entering the solar cell. So far your humble writer is unaware of the 2011 work making it commercial products, which of so would have been, or should be, quite noticeable. This suggests there are some difficulties somewhere in the run up to products. Hopefully someone will advise of commercial applications. These are huge improvements. But with natural gas so low cost for now, a lot of the energy in the drive to advanced products has cooled. One hopes that these massive improvements can overcome the low cost obstacle. But it takes quite some financial courage to get there.